Originally opened as a glitzy VIP accommodation for the 1984 Winter Olympics, the Holiday Inn was the ground zero of the siege of Sarajevo in the 1990’s and became a fortress for the world’s media covering the conflict. On April 5, 1992, a peaceful march for Bosnian unity turned into violence which people think of as the official start of the siege of Sarajevo. The conflict lasted nearly four years and took the lives of thousands of Bosnian Muslims, Serbs and Croats. Marchers were protesting against a worsening rift between the three main nationalist parties sharing power in Bosnia-Herzegovina – the Muslim SDA, the Serb SDS and a branch of the Croatian HDZ. I felt safer when I came to the hotel than on the streets of Sarajevo… but no, we didn’t feel safe there [either]. There is no way we could have felt safe. As the protesters reached the Vrbanja Bridge, snipers fired into the crowd killing two women: Sauda Deberovic and Olga Sosic. The next day, the number of protesters outside Parliament grew and Serb snipers began shooting into the crowds. Some of the snipers had been targeting people from inside the Holiday Inn hotel, which Bosnian Serb leader Radovan Karadzic had made his temporary headquarters. “Snipers who were using the hotel were facing the Parliament building. They were shooting at innocent people who gathered in front of the Parliament to protest against the war. That was a prelude to the war,” recalls Hajro Rovcanin, who worked at the Holiday Inn from the start and is now the hotel’s executive director. Journalists rushed to Sarajevo to cover the escalation of tensions, and although there was other more comfortable accommodation, the Holiday Inn soon became the centre of media coverage during the war. A significant amount video and still pictures of the war was filmed from the hotel. “I think maybe the Holiday Inn became the war hotel in Sarajevo because of a kind of an accident but also by design. Because of its unique location in the centre of the city, almost like a fortress that you can look out from all the sides,” recalls photographer Paul Lowe who was among hundreds of correspondents, photographers and crews that set up base in the Holiday Inn to cover the siege. “It had infrastructure, it had a safe basement, safe garage, had plenty of rooms and somehow, we are not sure how, the hotel management to keep the supplies of food coming in … So there was a sense that this being a concrete cocoon, which is completely false because people were shot dead on the entrance of the hotel,” says Lowe. The Holiday Inn was subjected to shelling and hit directly several times by heavy fire from Serb positions in the residential area of Grabvica and on Mount Trebevic. Eventually, parts of the hotel were uninhabitable due to destruction and shelling. And getting in and out of the hotel every day was extremely dangerous, remembers the BBC’s Martin Bell. According to 1995 UN figures, 225 people were killed there and over a thousand injured. “I spent a lot of time outside anyway. I felt safer when I came to the hotel than on the streets of Sarajevo, but no, we didn’t feel safe. There is no way we could have felt safe,” says Samir Koric, former Reuters translator and fixer. 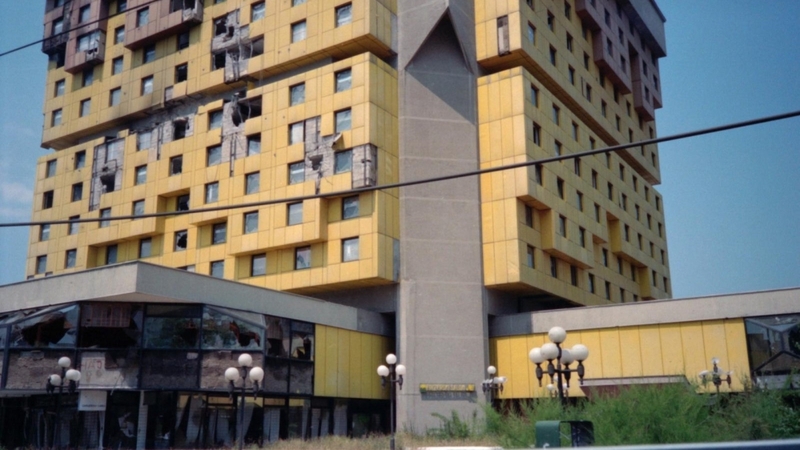 Despite the danger, the hotel continued to house the media until the siege was lifted on February 29, 1996 – following the signing of the Dayton Peace Agreement that ended the Bosnian conflict. More than 11,000 civilians had been killed. The Holiday Inn still stands today, albeit under a new name, a symbol of the endurance and fortitude of the people of Sarajevo – and a shelter for those bringing their story to the world when the people of Sarajevo needed them the most.